Lincoln-based J-Tech Solar is on course to complete a nearly 300-kilowatt photovoltaic system, one of the largest privately owned solar projects in Nebraska. It’s located at 300 M Street in the Lincoln Haymarket, on top of what used to be the Meadow Gold Dairy Plant, now owned by Telesis Inc. 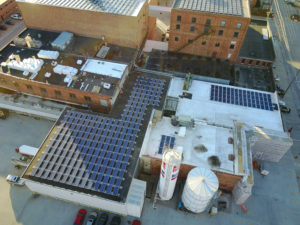 The 940 solar panels are being installed on a total of eight rooftops. Click “Solar Examples” on the above menu bar to check out more solar projects all across Nebraska. This entry was posted in Nebraska / Midwest News, NewsBlog and tagged clean energy news in Nebraska, energy-related bills in the 2017 Nebraska Legislature, GRNE Solutions, J-Tech Solar, SWT Energy on February 17, 2017 by Helen Deffenbacher.